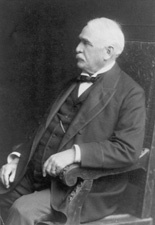 GIBSON, Paris, a Senator from Montana; born in Brownfield, Oxford County, Maine, July 1, 1830; attended the common schools and the Fryeburg Academy, Fryeburg, Maine; graduated from Bowdoin College, Brunswick, Maine, in 1851; engaged in the real estate business; member, State house of representatives 1854; settled in Minneapolis, Minn., in 1858; built and operated flour and woolen mills; in 1879 moved to Fort Benton, Mont. ; engaged in sheep raising, coal mining, railroads and water power; founded the city of Great Falls, Mont., in 1882 and became the first mayor; delegate to the State constitutional convention in 1889; elected to the State senate in 1890; elected as a Democrat to the United States Senate to fill the vacancy caused by the resignation of William A. Clark and served from March 7, 1901, to March 3, 1905; was not a candidate for reelection; resumed his business interests; died in Great Falls, Mont., December 16, 1920; interment in Highland Cemetery. Dictionary of American Biography; Roeder, Richard B. A Settlement on the Plains: Paris Gibson and the Building of Great Falls. Montana 42 (Autumn 1992): 4-19; White, W. Thomas. Paris Gibson, James J. Hill & the New Minneapolis: The Great Falls Water Power and Townsite Company, 1882-1908." Montana 33 (Summer 1983): 60-69.